I wore my pajamas to the store. I was make-up free and my hair was a complete mess. Call me a complete fashion fail! Thank goodness I was shopping from the comfort of my own home on the Box Tops for Education Marketplace online site. I just saved myself a bit of embarrassment. Now, let me save you some time, money and help you earn money for your child's school while doing so. The Marketplace, with major retailers like Target, Toys R Us, Wal-Mart and Macy's, and specialty shops like Oriental Trading Company, Build A Bear Workshop and Young Explorers, provides something for everyone's shopping wants and needs. 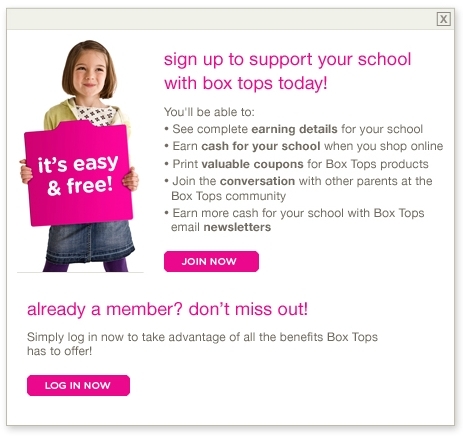 Just sign up to designate a school that will automatically receive eBoxTops as part of your online shopping experience. Box Tops for Education and its online Marketplace have helped nearly 90,000 schools across the country earn more than $525 million since the program started in 1996. Box Tops earnings are unrestricted dollars that schools can use for whatever they need most -- from textbooks, laptops and musical instruments, to playground equipment, field trips and basic classroom supplies. When talking to other parents about the Box Tops for Education (BTFE) program, I always find that one person who believes they cannot help because they do not purchase any of the food items that include the clip & earn BTFE on them. Others say they don't have the time or simply forget to cut the BTFE off of the item. That is where Marketplace can help. 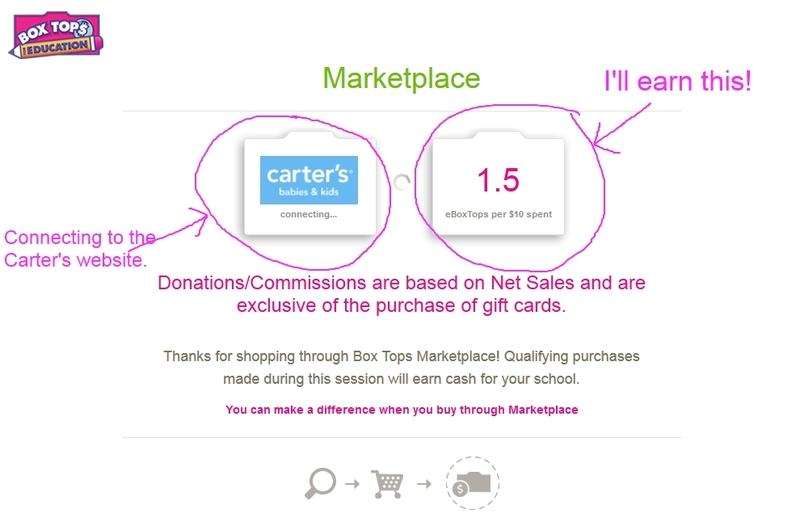 I want to shop on the Carter.com website to earn BTFE for my school. 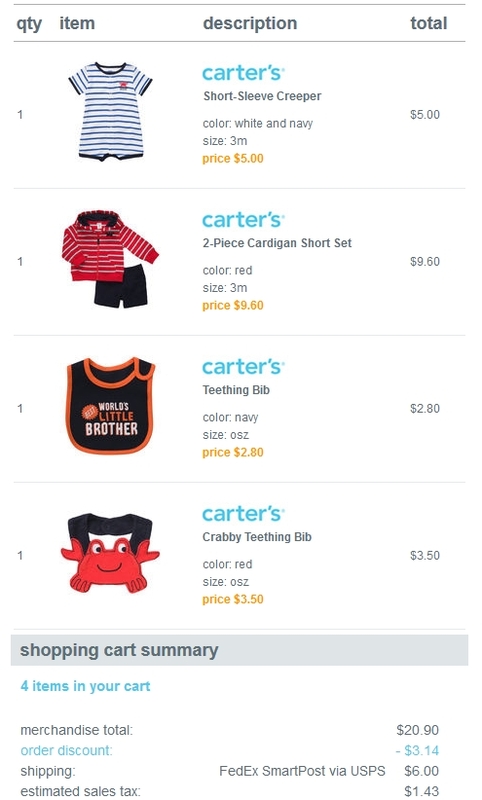 I type in 'CARTER'S' in the search box to see what results come up. If you remember, this particular website will earn me 1.5 eBoxTops per $10 spent. 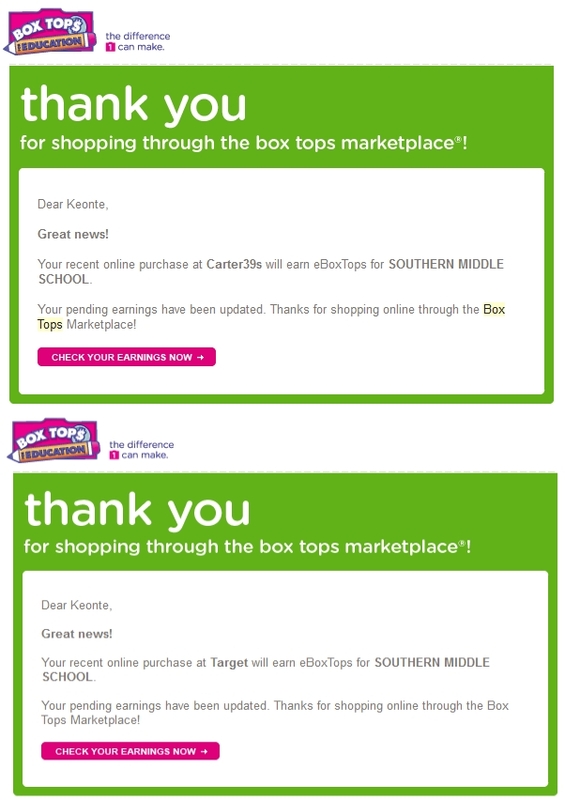 I spent a total of $20.90 (remember, shipping does not count), so I will earn 3 Box Tops for this purchase. I know what you're thinking, "That's not a lot of money." 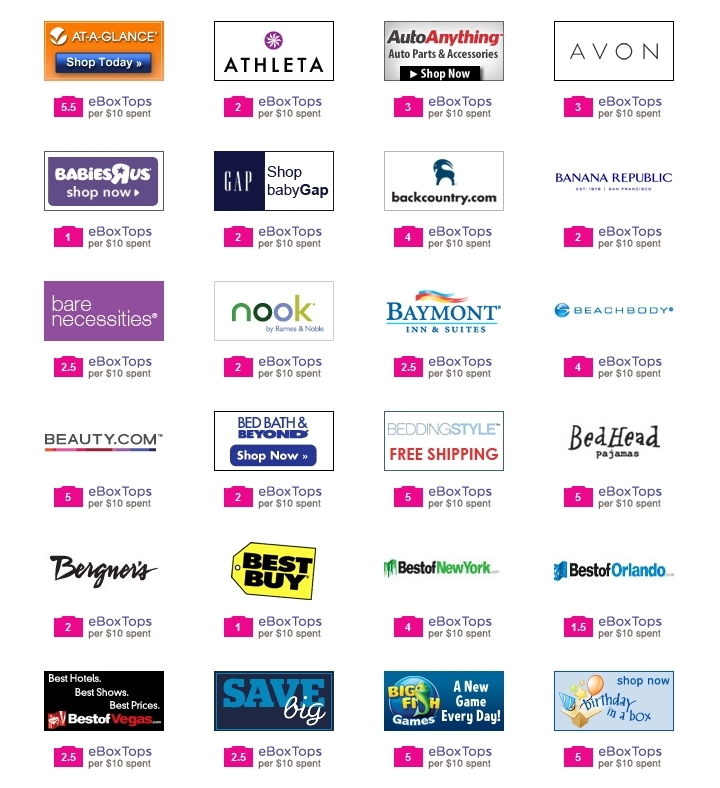 But multiply this number by all of the other stores you shop online and you the potential to earn money is endless. You can tell your friends and family to do the same as well. It's like being rewarded for shopping while earning money for a local school. Brilliant! It takes a few business days for the credit to show up in your account. Don't be alarmed if you don't see the Box Tops credit right away. When it is credited to your account, you will receive an email confirmation. 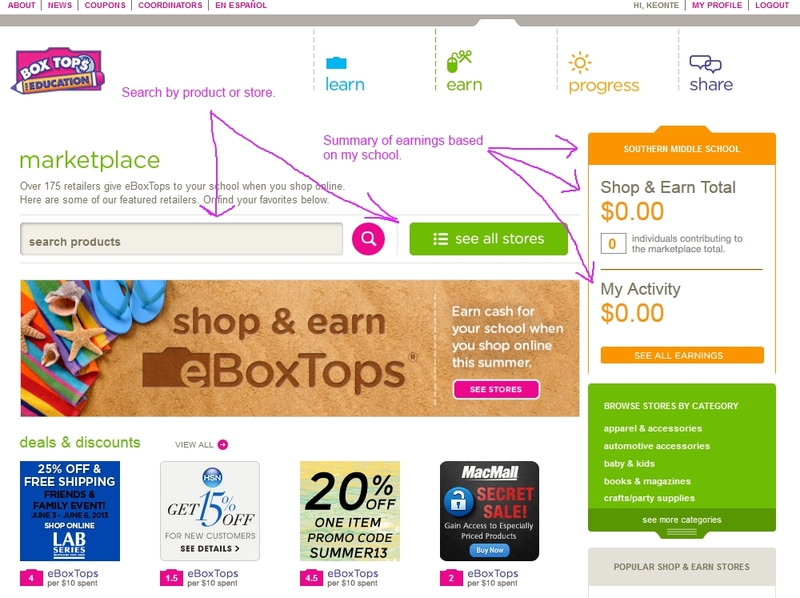 I would suggest heading to the Box Tops for Education Marketplace BEFORE you do any online shopping. This way, you'll never miss the opportunity to earn eBoxTops. You should bookmark the site to set even more of a reminder. 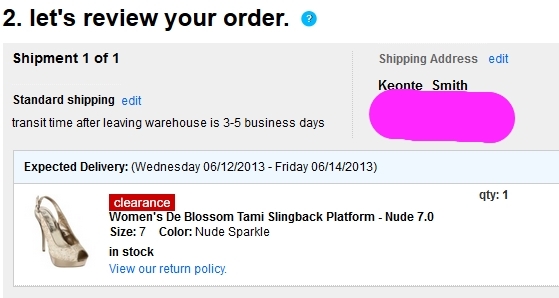 You don't just have to purchase clothing and shoes like I did. 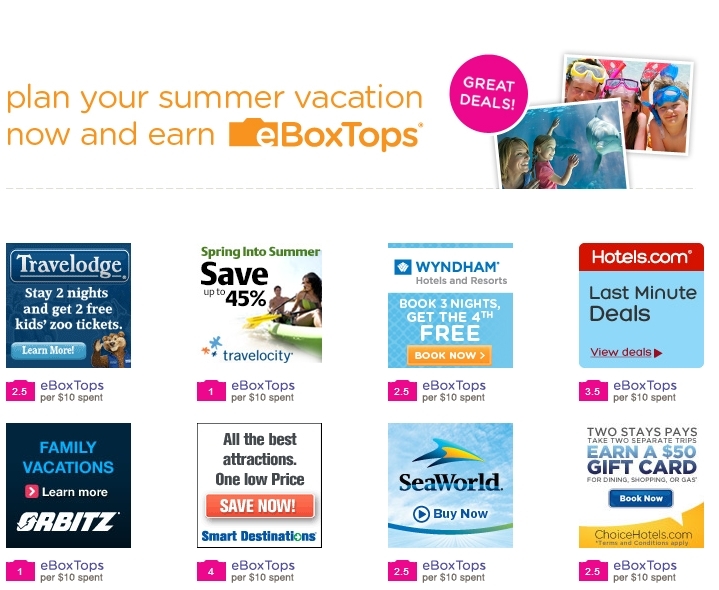 With summer just around the corner, you can even earn eBoxTops while planning your family's vacation. This is one of the easiest ways to raise money for your child's school. There really is no excuse why anyone would not sign up on the Box Tops for Education site. 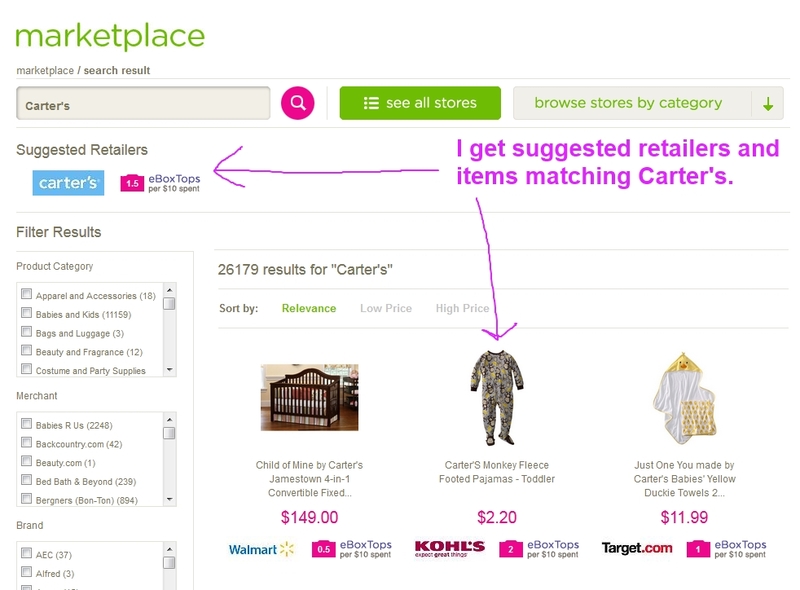 The next time you're shopping, don't forget to shop through Marketplace. Before it used to be, "Every penny adds up". Now, it's every Box Tops adds up. Don't let $.10 get away. Sign up today! BTFE sent me a gift card to use on the BTFE Marketplace site so that I could share my experience. I am also a member of the Box Tops for Education Blogger Panel. However, this opportunity is separate from this group. The opinions and views are my own.